A political group, Yaman Peace Frontier (YPF), says it supports the Nigeria Police investigation of Senate President Bukola Saraki in connection with the April 5 Offa robbery. The convener of the group, Mr Olawale Gbadeyan, said this while speaking with newsmen at the inauguration of the group on Friday in Ilorin. Gbadeyan said the group was satisfied with the investigation of the Police because it followed due process. “All of us in Kwara are behind the Inspector-General of Police, Mr Ibrahim Idris. “We want him to do a full and thorough investigation and prosecute whoever is found culpable in the Offa robbery incident. He maintained that recent event emphasised the need for Kwara people to be more security conscious and alert at all times. He also commended President Muhammadu Buhari’s decision to award Chief MKO Abiola the country’s highest honour, Grand Commander of the Federal Republic (GCFR). According to him, no one in Nigeria will talk about democracy without mentioning Abiola because he sacrificed his life for the sustenance of civil rule. He implored youths not to allow any politician to use them for selfish interests. “If anyone asks you to come and truncate the peace of your locality, tell them to ask their children to lead you. 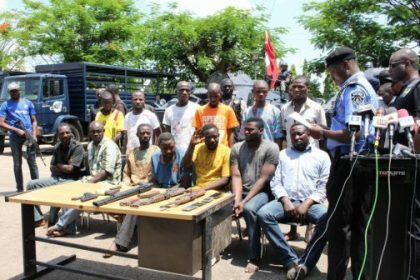 “Politicians no longer just use and dump youths, they now use and kill,’’ he alleged.